This beautiful origami lotus flower is an intermediate-level project that anybody can make with a little bit of practice. 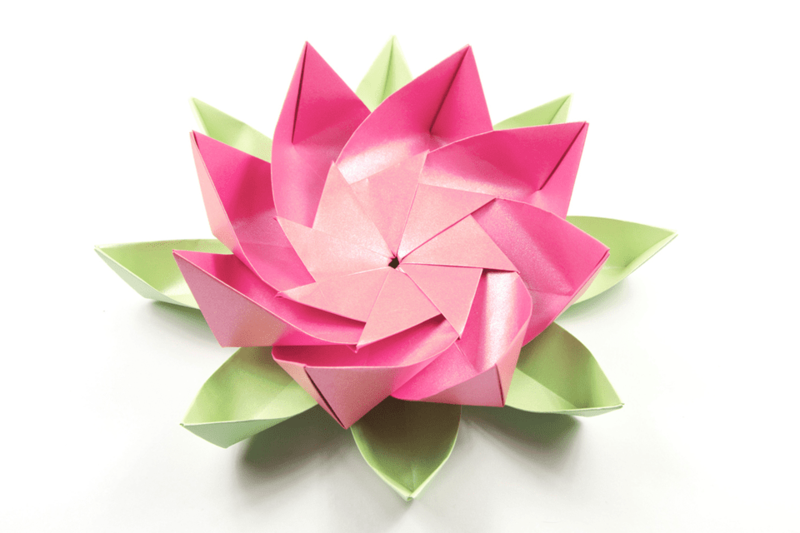 The end result is a striking origami flower that you can use for a party or home decor. Note that all sheets of paper should be the same size. We recommend using textured paper, however, plain printer paper also works well. Fold 1 piece of paper in half, moving the bottom edge up to the top edge. Crease well. Fold in half again, moving the bottom edge up to the top edge. Fold the bottom corners diagonally towards the middle, aligning with the crease you just created. Do the same with the top left and right corners. For the top corners, be sure to only fold the front layer down, and leave the back layer of paper as is. Fold the top section down to the bottom edge, squashing those corner folds. Flip the paper over to the other side, from left to right. Fold the top left and right corners diagonally down to align with the central crease. Fold the top section down to the bottom edge. You should now have a shape that resembles a boat. Open up the petal and flatten out the edges. Fold one of the points toward the central crease and flatten it nicely. Repeat steps 1 to 3 until you have 8 folded petals. Start by making an "S" shape with the paper. The idea is to divide the paper into thirds. Shift the paper backwards and forwards until you have perfect thirds. Squash the "S" shape so the paper is folded into thirds. Unfold the paper. Leave small pencil marks at the top of each crease. Measure the length of your paper with a ruler. Divide the length of your paper by 3. Use your pencil to mark the 3 even sections. For example, if your paper measures 15cm (15 ÷ 3 = 5), you would leave a small mark at 5cm and 10cm. Now fold the left edge of the paper up toward the second pencil mark, and then fold again toward the right edge. Your paper should be divided into perfect thirds. Fold the right side of the paper over to the far (left-most) pencil mark at the top and then unfold. Next, fold the left edge of the paper over to meet the vertical crease you just made. Now fold the right edge of this top layer back over to the left. Do the same with the right section. Fold it over to the left and then the top layer in half back to the right. Your results should resemble the last photo in this step. Open the top flaps away from the center, like doors. Rotate the paper 180 degrees. Fold the bottom edge up to the top edge and crease well. Next, fold the bottom corners diagonally toward the center crease. Much the same as the flower petal module, fold the top corners (front layer only) toward the crease. Fold the top section down, squashing those corner folds. Fold the top left and right corners in diagonally toward the center crease. Fold the top edge down to meet the bottom edge. Repeat steps 4 through 7 until you have 8 leaf modules. When you're done, you should have a total of 8 petals and 8 leaves. Note that you may want to use glue whilst assembling the flower and leaves, depending on your paper. Thicker textured paper will hold together better than thin slippery paper. Assemble the flower by starting with two of the petal modules. Insert the bottom left corner of the right petal inside the flap on the left petal. Turn them both over together. You'll see that there is a flap there too–insert the left petal's corner flap into the flap on the right petal. Repeat the last step until you have a total of 4 petals assembled. Separately, do the same thing for the 4 remaining petals, so that you will have 2 sets of 4 assembled petals. Place the 2 sets of petals so that they are facing each other. The left one's lower right corner should be over the top of the right one's lower left corner. The right one's upper left corner should be over the top of the left one's upper right corner. Insert the flaps as before. Carefully flip over your flower. You might find the flaps are already in place. If not, tuck them in. It can be a little tricky to get the petals together. Glue helps a lot if you are struggling. Next, you can assemble the leaf modules in exactly the same way as the flower modules. The lotus flower sits on top of the leaves, if you want to attach the two to each other, you can use a dab of glue. You can make just the flower for this project if you'd like, which looks lovely all on its own. Use it as a stand-alone piece, or you can also use it as a catchall dish to hold small objects such as jewelry. For party decor, you can place a tealight candle in the center, preferably in a glass. To be on the safer side, use a battery powered tea light candle!